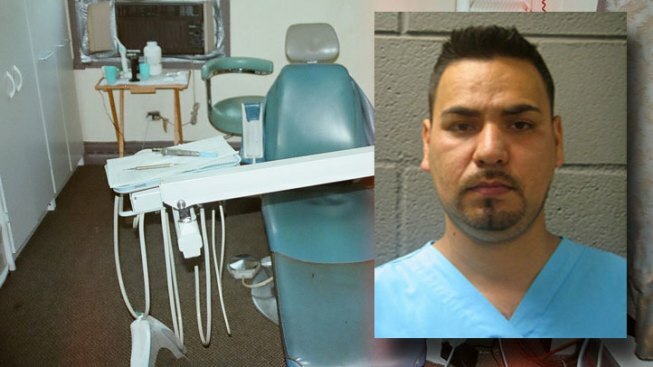 A Southwest Side man was charged Friday with practicing dentistry without a license in unincorporated Melrose Park -- including doing root canals, taking X-rays and installing braces. Alberto Nunez, 32, of the 7800 block of South Kenton Avenue, was charged with felony practicing dentistry without a license and misdemeanor unlawful possession of hypodermic syringes, Sheriff’s police said. "This wasn't something where the person was cleaning teeth out of his garage. He had, A - he had all the equipment, and B - he was performing everything from teeth cleaning to root canals," said Cook County Sheriff Tom Dart. Nunez was arrested Thursday for impersonating a dentist and performing various dental procedures on hundreds of patients at a home in the 2000 block of North Emerson Street in unincorporated Melrose Park, Sheriff’s police said. Based on a tip, an undercover officer set up an appointment via Nunez’ receptionist, police said. Because Nunez saw about 30 patients per week, the officer had to wait a week for an appointment. Once inside, the officer found a dental chair, lights, plates, tools, syringes, and an X-ray machine, police said. "The fire department was just blown away because there wasn't a major fire there because there were so many wires that were running everywhere, in and out of garages and under sidewalks that clearly were done by probably someone with fifth grade electrician background," said Dart. Police stopped a patient who recently left the office and learned Nunez’ performed a root canal on him, police said. Nunez also is accused of performing surgery, bite impressions, cleanings, X-rays and braces. Nunez is not registered with the state and told officers he went to dental school in Mexico City, but he could not provide documentation proving completion, police said. Police believe Nunez has been illegally practicing dentistry for about two years and had worked from previous locations. It remained unclear if patients knew Nunez was unlicensed. He was issued a $10,000 I-bond and issued a next court date of Sept. 6 in Maywood. Sheriff’s police are looking to talk to more patients and are asking anyone who visited Nunez to call (708) 865-4720.